Lunchtime prices are starters £5-£7, main courses £8 - £13, desserts £5 -£8. Charlotte's Place has one rare advantage over most Ealing restaurants: a view! When most Ealing restauranteurs battle with the street traffic, buses and an outlook over brick frontages, from Charlotte's you can watch the leaves turning across the wide expanses of Ealing Common. It's not just those who get a table by the window who can enjoy it, as the large windows and corner location opens up the view to everyone upstairs. 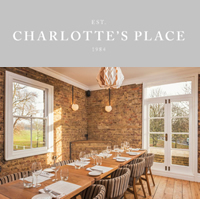 Some of you will remember Charlotte's when it was run by Charlotte herself; it was Victorian cottage kitsch, cosy and enclosed, with a distinctive personality. You loved it or hated it. The new owner has changed the look completely. The white walls and dark walnut tables, the deep leather chairs (very comfortable) and the warm lighting give it a clean and modern style. It's a small place, but there was enough room between tables. There's one particular table in the corner where both seats face into the room - my ideal, as I love watching other people and listening to the action - which has seen several proposals apparently. Not while we were there, unfortunately. An unobtrusive mellow jazz soundtrack plays. As for the food and service, we have two experiences to go on. The first was a quiet lunchtime, when the restaurant didn't know that we were associated with ealingtoday, and the second was an evening when we were the guests of the owner, Alex Wrethman. Now, I have always visited restaurants anonymously until now, and this was a new experience for me. So, first of all, lunch. My salad, sneakily disguised as Organic Field Greens, had balls of a creamy goat's cheese with real attack and a juicy dressing with summer berries. I'm not a great salad fan, but this was right up my street. The word that comes to mind (for the salad rather than for me, of course) is lush. As a main course, my medium rare steak and Portobello mushroom with Béarnaise sauce was again richly flavoured and the steak beautifully cooked. Our only reservations were the crispy French-fry style chips; neither of us were keen. The panna cotta was flavoured with berries - it's September, and encouraging to see seasonal produce on the menu. It looked pretty and tasted good, not overly sweet. Service was prompt and helpful. Our lunch was quite leisurely; if you were on a business lunch, I'd make a point of telling them if you were on a time limit. They are experimenting with the lunchtime menus, so let them know honestly what you think. The restaurant was busier for dinner in the evening, with one couple making the most of the last of the late summer sunshine at the outside tables. My particular favourite dish was the crispy aubergine, cooked tempura-style and it's saffron caramel, though I'd have liked a stronger lemon flavour to the risotto. Presentation is Masterchef-style with items laid on beds of other items and a circle of sauce - all quite fiddly and a lot of different flavours. Not everything works, but that's why it's good to know that the restaurant is prepared to experiment and ask for feedback. The sauces are worth paying attention to, however, as they are intense. As the kitchen is small, Alex told us, without space for a lot of dessert creation, they try to offer a high quality cheese board, sourcing from Neal's Yard. By chance, we ended up sitting next to Peter and Linda, long-time Ealing Today forum members and cheese-lovers, who had the chance to try them out, courtesy of the restaurant, so we look forward to hearing what they think. All credit to Josh, the restaurant manager, who came up with the recommendation of the Terlaner Classico from Alto Adige after I'd turned down his first suggestion (and he didn't look down his nose at me at all). Italian Wines Direct say about it; "The palate is long and dry, with complex interchanges in aroma and taste ranging from ripe peaches to celery, white pepper and flint." Ur, couldn't have put it better myself. Sounds very odd indeed, and I would never have chosen it myself, but it's a glorious wine and I'd recommend it to you. Ealing is sadly short of good modern British restaurants at the moment. Charlotte's Place is definitely worth encouraging.